On Halloween I saw a few scary profile photos. People had editing their usual profile pic to make themselves look evil, dead, like a witch, vampire or zombie etc. The tool that was used often is Picmonkey.com, so I decided to take a look. As I am one of the few people to know that all cats are evil, I decided to use a cat as an example instead of a person (i,e. me!). Using Picmonkey is really easy. You can drag a photo from a folder on your computer to the input box on the website. From there you can choose a range of edit options. While the Halloween part is gimmicky, there are plenty of useful photo edit options. For anyone who wants to do a quick photo edit without installing some software (there are some great free options to install on a PC, like Irfanview and GIMP for Windows), Picmonkey is a good tool. One nice feature of Picmonkey is the photo collage tool. Well, it makes a nice montage of photos, like what those pro photographers sell you. The best way to learn more about Picmonkey is to read their blog – blog.picmonkey.com – and have a play. I am only really posting this as I wanted to share this silly photo of an evil cat. I also have to admit that I did this on a bit of a whim and grabbed a cat photo off Google image search. I have tried to find the original photo, but my edit has distorted it so much even Google image search cannot find the original! 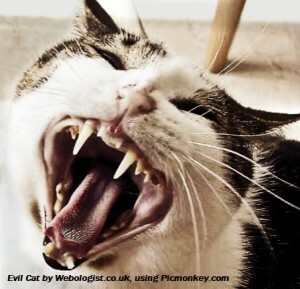 It does turn out that I am not the first the make the same cat photo into an evil one though! Weird. Google image search can find other distortions, but not the original.